Went to the College in Teileann in the early 80s and went back to camp there later. Drove through there a few summers back and there was traffic congestion which was slow but orderly. I couldn't figure out how it was flowing so smoothly until I got up close and there was a Guard directing it from behind a wall on one side of the street, (opposite the church) smoking a pipe. Priceless. :-) Thanks Sintheface, It's a small world in huge Donegal. Haven't been back to the Frosses for decades. But do visit here fairly often. 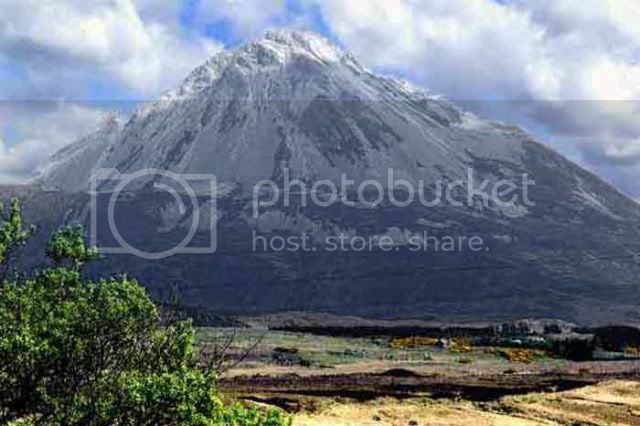 Mount Errigal not too far from Leo's Pub where Enya and her family lived. Delicious meals served there. Some nice music memorabilia to gawk at. 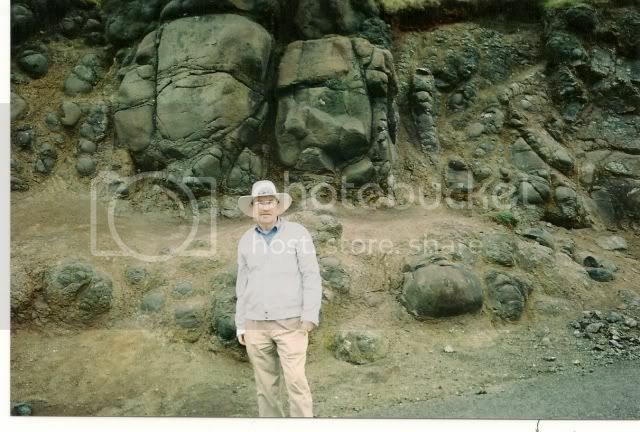 Old fogey at the Giant's Causeway with creatures in the rocks. A rock from there the size and shape of a cannon ball was extremely heavy. Needed two hands to pick it up. It's an amazing place to visit. Go very early on a Sunday morning and have the roads to yourself. 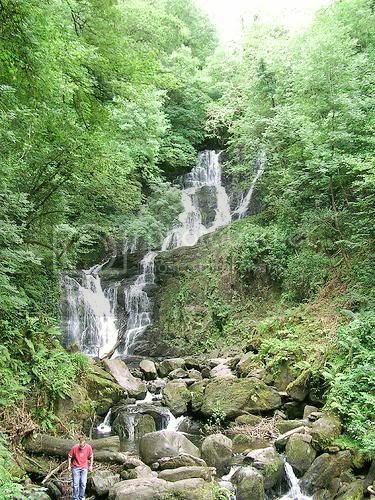 Torc Waterfall not too far from Killarney. This lovely photo is a public domain image. Mine were too dark, and not at hand these days. 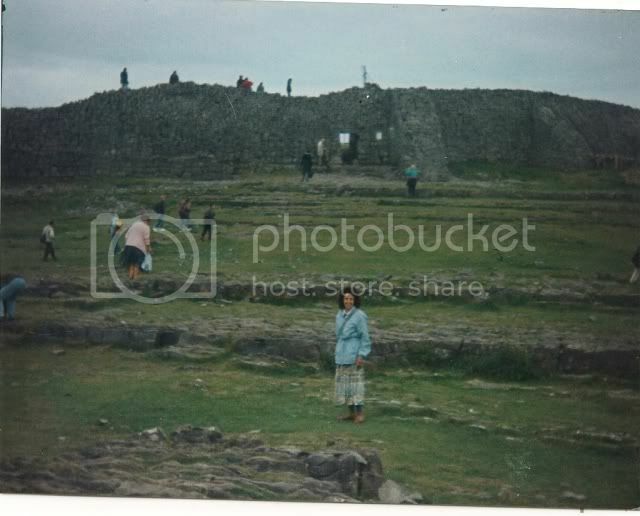 Dun Aengus an ancient fort on Inishmore of the Aran islands. Perched on top of steep cliffs above the Atlantic ocean. A wonderful experience to visit on a sunny day. Hold on to that beautiful pic...if the money mongers have their way...they'll promote a nuclear plant right on top...for the betterment of the Irish people...don't ye know !! No chance, whydontwe. Not now! 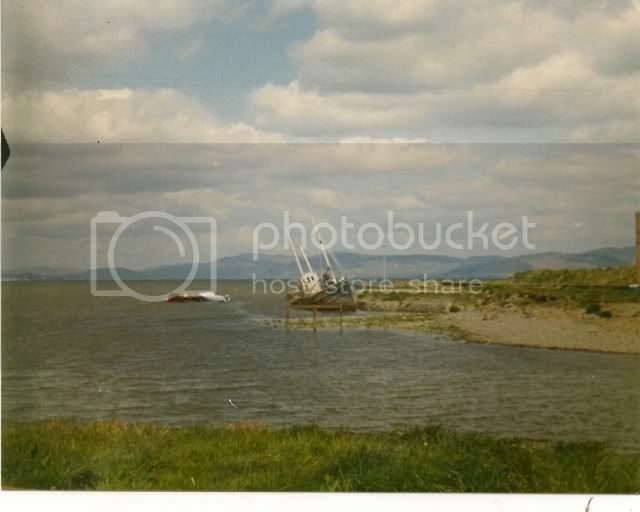 This is a coastal scene on the way to Carlingford lough. Where you can see the mountains of Mourne sweeping down to the sea. Fantastic thread, MauriceColgan! Look forward to seeing much more from you. 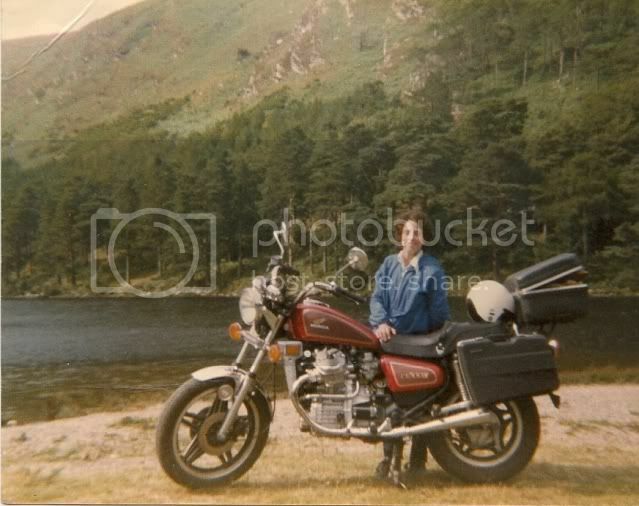 Am from the Midlands / S Ulster, our only hols (only ever for a cupla days @ a time) were always in either Donegal or Galway. I keep promising myself I'll make time to take a fortnight to drive round the country, especially south of the Dublin - Athlone - Galway line. Taken near Newquay on the Clare Galway border. I took this in June 2002. This is the old road which leads down to the deserted village on the Great Blasket Island. Once home to the likes of Peig Sayers (Author of "Peig" who is loved or loathed by generations of Irish). Across the Sound to the left lie Dunchaoin, Ventry and the Kerry Mainland. "Ryan's Daughter" was filmed there and you can still see the Schoolhouse constructed for the film set perched on a hilltop whilst taking the boat trip over to the Great Blasket. One of the most amazing places to visit. I highly recommend it. The emptiness, solitude and peace which can be experienced there whilst strolling the length and breath of the island or even just while having some quality chill out time is wonderful. A deeply moving and spiritual place. Great thread Maurice some great shots. 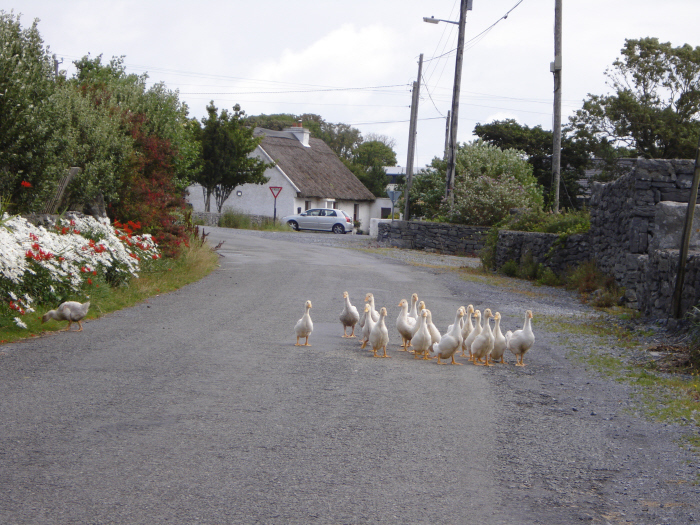 I thought I'd post some random pics from treks around Galway and Kerry. A bit of Joyce Country. The third shot from the end at around the 25 second mark is, for me anyway, Ireland. Abandoned cottage in a forest Northeast Kerry. Road from Maum to Maam Cross. Sheep on a mountain Maum east. Sunset with lenticular rays over Lough Shindilla. Last edited by Munnkeyman; 17-03-2011 at 12:24 AM. Yes widen your travels, this little country is huge! Lovely photo, electionlit. Typical of many back lanes. Oh yes Ah Well, the Dingle peninsula is a fantastic place to visit. Not a level piece of ground on the great Blasket island! Well maybe the beach. And that slopes. 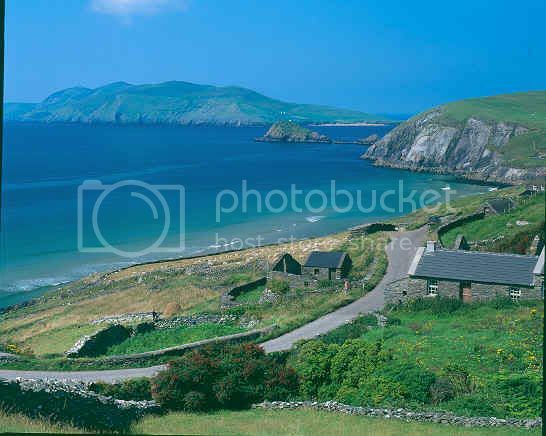 :-) Love visiting there after we first camped on Slea Head circa 1971. Also stayed in the farmhouse there overlooking the island from a bedroom in the bright sunny morning! Krugers pub back in 1971 still had sacks of potatoes and hams hung above the bar. I had long conversations with the locals there and discovered their lifestyle was full of story telling, music, house parties, and the occasional busy period when planting and reaping were important. :-) We factory workers were wage slaves in comparison. Only affording a fortnight a year there. The waves on the beach below Slea head were heavy and knocked waders off their feet! Was sand blasted one morning when caught unaware whilst swimming away from shore. 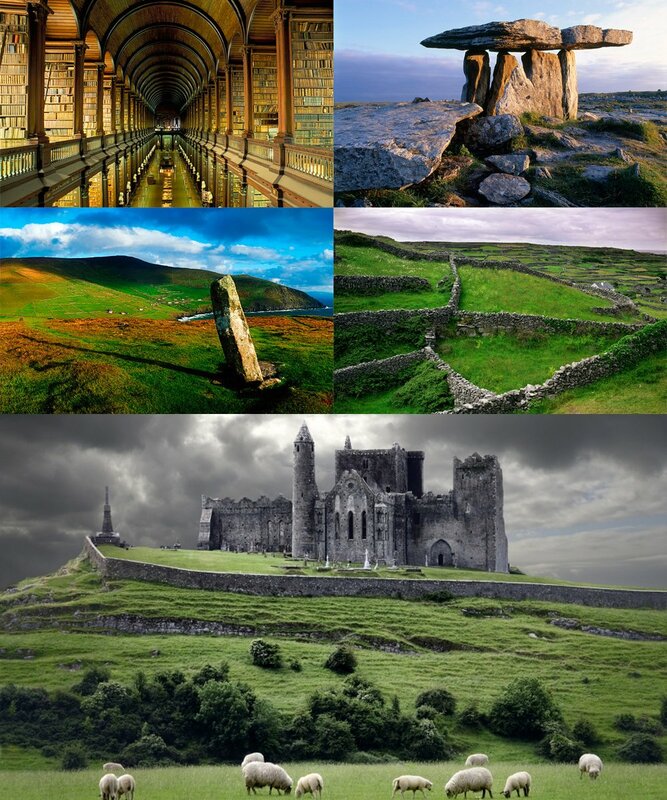 The new Windows 7 Ireland theme is not just a collection of beautiful imagery from the island, but also an acoustic experience complete with sounds generated by uilleann pipes, fiddles, whistles, etc. Note: this themepack works with Windows 7 only, but all is not lost for those who are using another operating system, you can download the wallpapers here. The resolution is 1920x1200, you may resize the images to your likings. And here are the system sounds, you'll have to select them manually for the respective action in your sound scheme control panel. Last edited by TotalMayhem; 17-03-2011 at 03:40 PM. Thanks TotalMayhem, but I think you will find we have just about everywhere in Ireland covered. 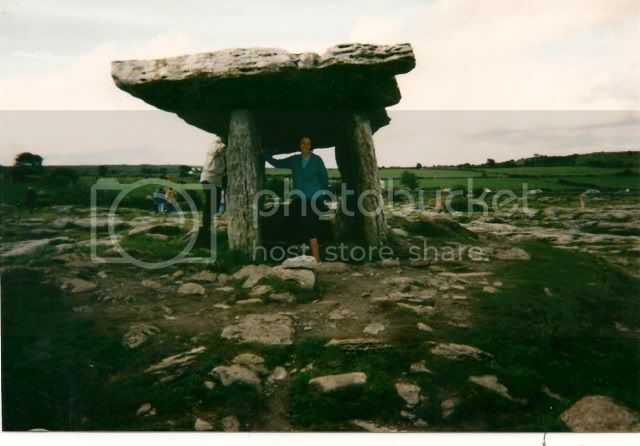 On the Burren county Clare a favourite destination when high pressure domninates the weather forcast. The Pastoral symphony by Beethoven with a dash of Shostakovich's 5th!